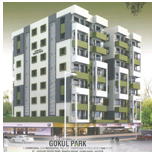 Harihar Infrastructure Development Corporation Limited - Service Provider of harihar nagar infrastructural development services, gokul park infrastructural development services & harihar business park in Nagpur, Maharashtra. Harihar Nagar, Zari is a proposed new township in 25 acres at Zari, 9KMs from Nagpur Airport, on Wardha road. It is situated amidst lush green surroundings and open spaces with schools, colleges, hospitals, temples, highway and VCA stadium in the vicinity. In phase-1, 164 units (independent bungalows, row houses and twin houses) will be developed with top class infrastructure like roads, electricity, drainage system, sewage treatment, Jogging track etc.